Kiwi kids are born travellers, with the big O.E. engrained in our culture and a sense of adventure and worldly discovery encouraged from a young age. 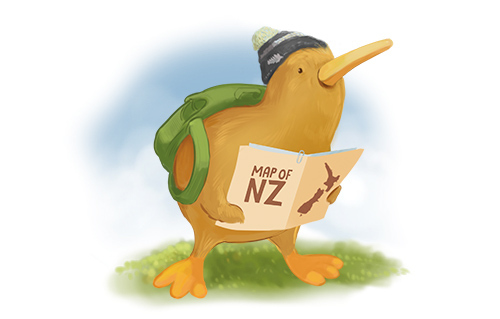 And yet, it’s difficult to find children’s picture books that ignite this passion of New Zealand and the world, evoking that great Kiwi travel spirit. Living overseas and tired of searching for just this kind of book for her three kids, Kiwi mum Beks took matters into her own hands. With the help of illustrator brother-in-law Laker, and sister Steph, Tama was born. Tama adventures around his homeland, right from the top to the very bottom – your children, nieces, nephews, grandchildren and friends’ children will love going along for the ride! We want to make it easy and safe for you to enjoy our books, so you can buy either through PayPal or by bank transfer. It's easy and safe, so no need to worry. We want to avoid charging you those pesky delivery fees, so we'll send your book by standard post to New Zealand and Australian addresses. Too easy! Tama won't stop at New Zealand, he'll go around the world! Let us know where you'd like to see Tama go, and keep an eye out for the next adventure.